Welcome to Thule, a primordial land of fierce barbarians, elder horrors, and savage wilderness. In this ancient age, humankind is a young race, newly arisen on a monster-haunted Earth. Cities of cruel splendour lie scattered across the great lands of the north like a handful of gems strewn from a dead thief's hand. This is a doomed age, a time of great deeds and inhuman terror destined to be lost and forgotten beneath the numbing cloak of endless winter. But for one glittering moment Thule lives - and it is a fierce, cruel, splendid, and marvellous moment indeed. 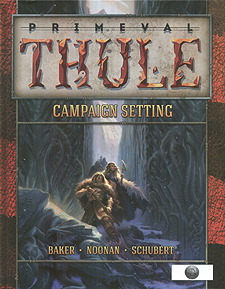 This tome provides everything you need to introduce the world of Thule to your favourite roleplaying game. A new character race, the Atlanteans. 19 heroic narratives such as free blade, ice reaver, and star-lore adept. Over 40 new beasts, monsters, and villains to challenge your players. A full colour map of Thule. 3 ready-to-play adventures to begin your campaign. A detailed description of Quodeth, City of Thieves, the perfect home for bold heroes. And a whole continent of savage adventure to explore!